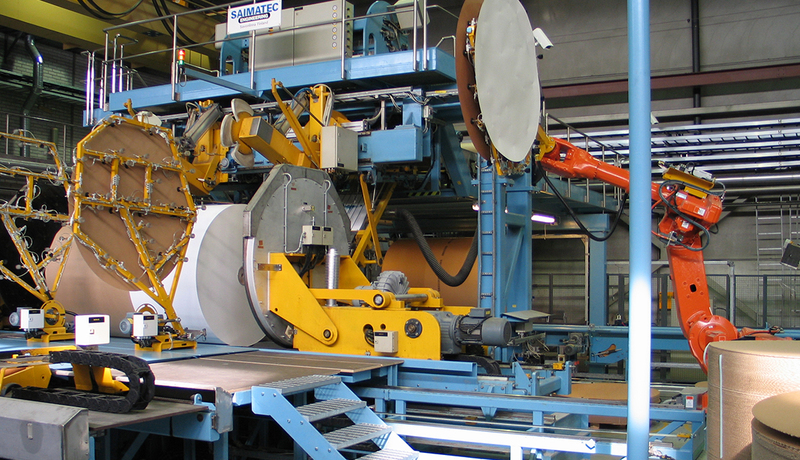 Saimatec Robowrap is the state-of-the art choice for full automatic roll wrapping at paper mills with high roll volumes, with capacities up to 200 rolls per hour. Recently, also mills operating at medium or lower capacity ranges, around 60 rolls per hour, have discovered the benefits of having a full automatic wrapline. Saimatec’s RoboWrap Single concept makes full automation of wrapline operations very affordable at these capacities, too. Operator’s tasks are limited to refilling materials and housekeeping when needed. Operating the wrapping line can be combined with other tasks, such as rewinder or warehouse operations. Full automatic system works with stable cycle time day to day, with consistent quality. Head pads, wrappers and labels are placed automatically onto the roll. Operator does not need to enter the machine area while the system is running, which makes operation very safe. Monotonous and tiring manual work is eliminated by automatic manipulators and robots. The RoboWrap Single concept uses one robot and a unique two-function manipulator for handling both inner and outer heads with the same system. This ingenious solution enables installation of a full automatic head handling system even in a limited floor space, which is often the case in existing mill layouts. Also the investment cost for this compact arrangement is lower than in the conventional alternative having independent robots for inner and outer heads. The RoboWrap Single system is available for new wraplines and modernisation of existing systems as well. As other memebers of the RoboWrap family, the RoboWrap Single is also available in two variations: Classic and Optima. First RoboWrap Single systems have successfully been taken into operation during 2008 and 2009 at Stora Enso Ingerois Board Mill in Finland and Felix Schoeller jr. Osnabrück Paper Mill in Germany.